Need to add Google Maps to WordPress? There are lots premium Google Maps plugins for WordPress that can make the process much easier. There are so many in fact, that it can be tough to know which one will suit you best. In this article we’ve collected 9 of the best WordPress plugins for Google Maps. All of these plugins can be used to add responsive Google Maps to any post, page or sidebar. If you are running a business from a physical location, such as a brick and mortar store, your success will depend on people finding your location. People aren’t going to spend too much time browsing your website to figure out how to find you. This is why it’s important to make yourself as accessible as you can. The best way to do this in WordPress is with a plugin. Although Google Maps has it’s own API, it’s not the most elegant tool. First off there is a bit of a learning curve to overcome, second the Google Map API doesn’t provide many options for customization. This article outlines 9 plugins to help you embed a custom Google maps with WordPress. These plugins enable you to add locations, markers, directories, meta info, animations, custom icons and more. Easily build professional maps with no coding, no API keys and no unnecessary stress. WPBakery (formerly Visual Composer) is the king of drag and drop page builders for WordPress. It is highly developed, easy to use and offers endless design possibilities. Users do not need to do any code to create beautiful and functional web pages in just minutes. While WPBakery is the best in the business when it comes to visual page builders, it is not the only game in town. There are some useful alternatives, both free and premium, for those who want something different. With free plugins you may experience more problems with compatibility, bugs and updates. For smaller projects, a free page builder may be just what you need. Other premium plugins may be useful for certain users because they are lighter and faster. You may not need all the options that WPBakery has to offer. Instead you can opt for something smaller in scope. This list contains 5 of the best drag and drop page builders available for WordPress. Next time you are at a family gathering or party, wait for a lull and see how many people bury their heads in their phones. It is all too common. Regardless of whether this technology is tainting social etiquette in group settings and ruining everyone’s posture — the number of mobile users connecting to the internet is constantly growing. With ever increasing speeds and more and more affordable mobile connectivity there does not seem to be any slowing down in sight. According to SAP mobile technologies, there are now more mobile devices than there are people on earth. Additionally most of the devices connected to the internet at any given moment are mobile devices. For WordPress webmasters, this means that optimizing sites for mobile is more important than ever. If you are not prepared to offer mobile first websites, you will be missing out on the majority of the market. If your site does not work well for mobile devices, users will be quick to find another site that does. Mobile sites should look and feel great on tablets, phones and other mobile devices. In the past few years WordPress developers have come out with a slew of plugins to add mobile first function and style to your WordPress website. In this post we will look some of the best-selling plugins to optimize your WordPress website for mobile use. We will go over plugins that optimize the design and content to make browsing easy and plugins that increase loading time. Mobile still has a ways to go to match broadband and Wi-Fi speeds, so it is important to have sites that load quickly. Have you ever wondered why Contact Form plugins are so significant part of the WordPress? It is because WordPress CMS is a great platform to share your precious content with your readers, know their opinion about your subject and progressively build your fan base. A healthy fan base makes you feel rewarded and worth your efforts and there comes the role of Contact Forms. Contact forms are trending as the most famous mode of medium to get connected with your audiences nowadays because of some totally amazing benefits. Therefore, analyzing all these factors, we have selected a list of the best choices in the Contact Form Plugin category on all the parameters. So, let us go through the list. Nearly any online selling WordPress project wants to accept credit card payments without problems or technical difficulties. One of the reasons people love WordPress platform so much is because it makes selling products and accepting payments online very easy. Setting up a payment gateway can be one of most lucrative, yet difficult tasks while creating and managing a website. This is an area where you will have to do at least a minimal amount of research, or hire professionals as an alternative way of solving the issue. There are lots of plugins on the market that can help you to achieve your goals. Free ones, usually end up sending customers away from your site. Most small businesses will want to add a payment gateway directly on their website. This way people would not have to leave your site and you can provide smooth transactions for your customers. This post will go over a few terms related to accepting card payments directly from your website with WordPress. We will also introduce a list of plugins to help you in this direction. Coupons, vouchers and other discount tools are very important for any WooCommerce project on the WordPress platform. They can also be very helpful for other types of WordPress projects: membership websites, community hubs and even corporate representative websites or personal blogs. The main goal of any coupon or voucher is to attract your visitors’ attention and keep them engaged with your products, services or just some pieces of content. By providing discounts on your (or your partners`) products or services you gain much more interaction between your website visitors and your content. This changes positively influence on your website`s reputation among the search engines: bounce rate is significantly reduced and user engagement in form of time spent on site and the depth of a session is increased. WordPress platform allows you to create coupons and vouchers without any special web development knowledge and skills. There are plenty of WordPress plugins for each purpose you may need within your special offers and discounts. We have gathered the list of the most interesting and efficient premium plugins for you to choose from. Black Friday is at its peak but it does not over just with the 50% deals on each WordPress plugin and theme on Envato Market. Today we want to share another important information on massive discounts within Envato Market. These discounts concern to Cyber Monday on 26th of December 2018 and are provided by Envato Elements platform. Envato Elements is the subscription type of platform, that offers the same products as Envato Market but with unlimited access to them within a monthly fee. The special Cyber Monday deal starts on 26th November, 2 p.m. AEDT and ends on 27th November, 8 p.m. AEDT. Instead of $33 per month of subscription you can pay only $19 per month. Within the annual subscription the price has lowered from $198 to $150 per year. Cyber Monday and Black Friday super deals are coming to Envato Market for all WordPress website owners who want to grab some hot premium plugins and themes at 50% off! This year`s campaign starts on Tuesday 20th November, 2 p.m. AEDT and ends on Tuesday 27th November, 8 p.m. AEDT. It means we should prepare ourselves for a whole week of amazing deals! With this article we bring you the premium items from Envato Market chosen by the platform representatives: 5 best WordPress themes and 5 best WordPress plugins to purchase within Cyber Monday and Black Friday 2018 campaign. We will also provide you with the list of the best deals from Envato Market as soon as all competitors will announce their deals. Stay tuned to the important updates of this main topic for the year 2018! Update: Top 100 WordPress items` list for from Envato Market is now available — 50 of the best selling WordPress plugins and themes at 50% off! Quick Tip: When Premium WordPress Plugins Are Worth Their Price? There is always a kind of dilemma about choosing between free and premium plugins for your WordPress website or blog. There are lots of free plugins` examples which can serve you not worse than their premium competitors. On the other hand, premium plugins always have their advantages like professional customer support or guaranteed auto updates. Unfortunately, there is no universal answer to the question whether premium plugins are worth their price. There are some strategies to estimate the value of premium plugins` purchase for the most popular cases of WordPress administrator`s practice. We will try to share the basic tips on such strategies with you through this article. Mobile applications (or simply “apps”) represent the new way of user interaction with websites of all types. Any modern WordPress website should aim to have at least a mobile version of its content. The next step of involving users into your WordPress project is the creation and development of a mobile application. There is a strong trend of modern users` transition from desktop devices to mobile ones. In other words, people are using their smartphones and tablets more and more often to visit websites, read news, estimate and buy products and services, leave their comments and testimonials, and much more. Modern mobile devices are already providing users with all corresponding opportunities according to their demands. However, not all web projects appear to be ready for such changes. Is your WordPress website ready for them? Most beginners in the field of WordPress website administration delay the development of mobile application for their project. This is an awful mistake to make, because the share of mobile users is always growing. It means you will constantly loose audience without a proper mobile application for your project. We will analyze the opportunities WordPress gives website owners to convert their projects into mobile applications. The process is not so complicated as many WordPress website owners imagine. Premium WordPress plugins and services are ready to make the most difficult parts of the work for you. We will observe some examples of such tools in this article to give you a sophisticated understanding on how to convert your WordPress project into a mobile application without special web development knowledge and skills. Every beginner in the sphere of WordPress website development wants to save money on first projects. This is not even a question of greed, rather a deliberate approach to initial steps of your long road to become a successful WordPress website owner. Most WordPress newbies just prefer to select only free plugins and themes. However, there is a crucial mistake in denying all premium products at once. Mainly because there is a perfect way to use the great pool of WordPress tools with a relatively small monthly fee. The way to save significant amount of money on premium WordPress plugins and themes is Envato Elements. This platform gathers a surprising amount of various items you may need for your WordPress website development. We will describe all the opportunities of Envato Elements service within this Quick Tip article. We believe it can change your approach to WordPress tools usage and upgrade your admin`s vision to a qualitative new level. Nearly any type of business needs to deal with appointments. It is much easier to set up your calendar and give your potential customers their opportunities to pick the most convenient date and time, if you have a WordPress website with a proper toolkit. Online appointment booking became the most preferred one among all types of customers since it had been invented. The main reasons for such choice are the speed and the comfortable conditions for each user. Such amazing feature as online appointment booking could not be ignored by WordPress platform. There are thousands of different free and premium plugins to set up your own appointment calendar within the WordPress website. These tools require no special web development skills or knowledge and serve as multipurpose tools for planning purposes. Premium tools of this category give even more opportunities towards automated planning and employees` control. Amelia enterprise-level WordPress appointment booking plugin is one of such premium tool of the new generation. This plugin allows a WordPress administrator to maintain a big team of employees and great amount of customers with the help of the perfect automated assistant. Amelia`s features go far beyond planning and booking. We will consider and analyze all of the main features of Amelia in this review, for you to be well-informed about this product and meet your own thoughtful decision about purchasing it. When you are trying to take steps to direct more traffic to your WordPress website, it is really important to make sure your users keep browsing. One of the best places to focus your effort is the navigation menu. Strictly saying, the menu is the roadmap of your website. More often than not the navigation menu is what draws users deeper into your site. Ideally you want an intuitive menu that helps people find what they are looking for, instead of just staring blindly at the page because they are lost. The navigation menu is one of the most important components of a successful website. Even if your site looks amazing but your visitors do not decide to stick around and browse, it is useless. Each click on the menu can encourage or discourage your visitors to stay. Making sure your menu attracts visitors can keep you from losing traffic due to frustration. Fortunately designing a successful navigation menu is not hard if you use proper WordPress tools. We have collected some of the best plugins for creating fluid and responsive fly out menus in WordPress. Comment form is one of the simplest (and therefore one of the most important) ways to involve your WordPress website visitors and provide them with a feedback opportunity. Comment forms represent the way to concern your users` time and effort to take part in the life of your project. That is why you probably will need to style any default WordPress theme`s comment form into some unique shapes. It could be very small nuances but they do play the important role on how users perceive your WordPress website or blog. Most premium WordPress themes allow an admin to customize all elements of his website within a convenient drag-n-drop editor. Today we will consider a bit more complicated but much more all-purpose way to customize your comment forms — with the help of CSS stylesheets of your WordPress theme. This experience will also help you to acknowledge the basic opportunities of WordPress website development and maybe proceed further in learning hidden traits of the WordPress platform. Maps can provide lots of important and useful features for your WordPress website or blog. Travel sites, companies with local and worldwide representatives, cafes and restaurants, gyms and fitness clubs, charity and non-profit organizations — all these and much more other categories of websites need maps to guide their users through some important content. And of course, maps on your WordPress site should me interactive. One way to create and edit interactive maps without any knowledge in web development and design is to use Google Maps plugins and widgets for WordPress. But the opportunities of WordPress platform go far beyond standard features of Google Maps. We will share the most important information about the best premium WordPress plugins for creating and editing interactive maps on your website. These maps are more flexible and provide opportunities to create your own maps (for example, map of a supermarket or a mall) or track visitors activity through all regions of the world and display it live on the site. We will consider 8 premium WordPress plugins for creating and editing interactive maps in this article. Each of the plugins has its own set of features and possibilities. Thus you can choose the most suitable interactive maps for your project to provide your users with the options they are looking for. Do not forget to analyze your visitors’ behavior before making any decision. Why Should Your WordPress Websites Be Enabled with Bitcoin Payments? What if I tell you there is a way to attract new customers, increase revenue, reduce frauds, save payment costs on your website with no investment at all? Every once in a while, technology takes a big leap and businesses are usually the first beneficiary and also the first victim of these innovations. Those who innovate and catch-up, ride the wave to the top and those who ignore it are sometimes washed away. Booking and reservation option are the most important features for any modern WordPress website that offers services in the sphere of tourism. Hotel or apartment reservation is one of the first steps each tourist makes while planning his vacation. That is why online services in this sphere are very popular and important. WordPress offers the best conditions for the beginners in the sphere of website administration and hotel business is not an exception. Lots of dedicated plugins allow WordPress admins to easily get their customers` requests and handle them quickly and conveniently. Customers are happy to receive a good service and hotel owners are pleased with fast and secure booking process. This way WordPress opens opportunities for both sides to take advantage of online reservation and payment process. We have decided to gather our list of best selling premium WordPress plugins for booking and reservation services. These plugins represent the modern opportunities of the WordPress platform and are available for website administrators without any special web development or design skills. Get acquainted with our list to pick your favorite booking plugin easily! The importance of communication with your WordPress website`s users can not be overestimated. Quick and live feedback is crucial for any e-commerce project but also an important advantage for any other type of WordPress project — from a personal blog to a big company`s presentation website. One of the most convenient ways to contact you for users is the live chat on your WordPress website. Live chat should offer the immediate connection with one of your managers or you personally (if you prefer to take control on any action done by user on your website). This feature also creates the effect of a full support for each of your users and customers because they always see the opportunity to contact you and get a quick answer. Even if you can not provide a 24/7 chat management, it can be helpful with automatic replies. Fortunately, you do not need to develop your own live chat from scratch. Lots of free and premium WordPress plugins are at your disposal. In this article we want to underline the most important features of a common live customer chat plugin on the example of Facebook Customer Chat and show you the advantages of using this kind of tools within your WordPress project. Interactive elements are one of the most crucial parts of any modern WordPress website. Although it is often complicated to create some amazing interactive elements on your WordPress website, there is one popular and accessible way to diversify your content in such a direction. We are talking about before and after image sliders. Before and after image sliders have a goal to show some difference between 2 images. These images are usually used to show a vision of an object or person before some action or event and after it. The immediate comparison is reinforced by a user`s interaction with your website interface: dragging or hovering over the first image shows the second one. Such interactive comparison involves users and make your image content much more popular. Before and after images are used within various website topics: medical (for example, to show results of a plastic surgery), all types of designers, photographers and artists (to showcase the stages of their work process), newspapers and bloggers (to illustrate some changes brought by dedicated news and events), science projects (to view results or plans of a project) and much more. Fortunately, WordPress platform offers easy and convenient ways to create before and after image sliders within your website or blog without any special knowledge in the sphere of web development or design. Lots of premium WordPress plugins were created to help reach this goal. Today we will observe the best of such plugins for the sake of your thoughtful and wise choice in terms of special demands of your website`s audience. Analytics is the key tool to understand what your potential and existing audience desires most and to create a successful content and UX strategy on this reliable basis. It means each WordPress website owner who wants to develop his or her project must have analytics tools and know how to use them. Most WordPress website owners know only the most popular analytics tool provided by Google. Google Analytics is surely the most versatile tool but it can be too difficult especially for the beginners in the field of WordPress administration. That is why we decided to introduce you to some alternatives from which you can pick the most convenient for your goals. We have gathered different analytics tools in this article to provide you with the deliberate choice. All of the provided analytics tools have proved themselves as reliable and user-friendly instruments of a WordPress administrator. Let us discover the most important analytics metrics and the tools that can keep you in touch with them. This May was full of new premium WordPress plugins worth to be mentioned and reviewed. Moreover, new plugins show us the reflection of the most relevant trends of WordPress development and design. These trends need to be observed by any WordPress website owner for the sake of sufficient development of his or her own project. The most urgent topics of May 2018 were: GDPR compliance, Cookies policy notifications, Artificial Intelligence integration, Quiz creation, Twitch streaming support by WordPress and many other interesting issues. Some of them are not new but constantly developing within WordPress. Another appear to be relevant only now. We have gathered the most exciting and prominent examples of new and trending WordPress plugins from Envato Market in this article. You should check them and think whether your WordPress project needs some improvement within the issues these tools are eager to resolve. There are numerous strategies to increase your website users` engagement through a good content. And we have already given some basic tips on creating a perfect text content for your WordPress website. But there are also different prospective from which you can improve your content marketing strategy significantly. One of such prospective is a group of WordPress plugins which help you to improve your content automatically or give useful pieces of advice while you are creating a new post or page. These content marketing tools are created by experts to provide professional support for beginners in the field of WordPress website administration and development. We have gathered the most interesting and useful plugins and services for content marketing improvement in this article. These tools will take your content to a new level of user engagement, especially when used in appropriate combination for your website audience and its unique needs. GDPR (General Data Protection Regulation) comes live in Europe in one week, May 25th 2018. If you are not yet acquainted with the term, then you should check out our previous article dedicated to the basics of GDPR and the most important actions a website owner need to take in accordance with it. You could have prepared your WordPress project in advance because the GDPR rules were announced very early. But if you have put this problem aside until the last days, then there is not much time left. In this case you could have think about some opportunities of solving the GDPR issue in a fastest and easiest way possible. Fortunately, WordPress plugins` developers have already brought some ready-to-use solutions for this new must-have feature. Artificial Intelligence (widely used as AI abbreviation) was an example of science-fiction matter just 20 years ago. Now Artificial Intelligence is the new step in the development of computer science and linguistics combined. AI used to handle all the boring and repeatable work for humans. But now it is rapidly evolving and making progress in lots of activities, making some things even better then human beings. That has even become a reason to worry for lots of people around the world. Would not AI become smarter than the most intelligent scientists? Will the AI replace humans once? But whatever you answer to these question by yourself, it is no doubt that artificial intelligence is a must-have tool for any modern website, business or community. What can a modern AI exactly do and how could you use its features for your WordPress website? This article will answer the questions related to Artificial Intelligence for website development. We will also observe the most interesting examples of using AI within your WordPress website for completing lots of different tasks. Food and restaurant business remains one of the most important and demanded industry worldwide. That is why WordPress offers lots of opportunities for food and restaurant websites in the form of free and premium themes and plugins. Previously we have reviewed the best premium WordPress themes for food and restaurant websites. Now it is time to study the additional opportunities provided by premium WordPress plugins. Any food or restaurant WordPress website has a need of different services for its users: menu, delivery, stores` locations, booking and reservations, recipes and so on. The set of important plugins is dictated by the individual topic of your food-related WordPress website. Today we present you the list of the most important premium WordPress plugins for food and restaurant websites. Among them you will find tools for different purposes and we believe that any owner of food-related website will receive an interesting piece of information within this article and the related plugins. WordPress is full of opportunities for every type of web project. These are not only thousands of WordPress themes for any possible topic but mainly WordPress plugins that could extend the functionality of your website significantly in a matter of a few minutes. Let us take a look at WordPress features that could be easily brought by plugins. In this article we have gathered the features and relative plugins which you probably did not know before. Some of them are created for special needs but most are useful for nearly any WordPress websites owner. The participants of our today`s list are premium plugins with extended features compared to their free analogues. These plugins include the quality control and professional customer support for their users. these features could be essential for the beginners in the field of WordPress website administration. Cryptocurrencies become more and more popular every day. This popularity is based on anonymous payments and lower transaction fees compared with the classic payment methods (such as credit cards, PayPal and other). The name Bitcoin was essentially registered back in 2009 by Satoshi Nakamato. Since those days there had appeared more than 1000 kinds of cryptocurrencies but all of them are connected with the one common principle of anonymous payments. We have already described some of the modern premium WordPress plugins which help to build cryptocurrency-based communities and provide service connected with different Altcoins. Today we will provide you with the full guide on creating Bitcoin payment method for your WordPress website. In other words, this manual will help you to set up an additional payment method via Bitcoin cryptocurrency for your customers. Taking into account the growing popularity of cryptocurrencies, this advice should be applied as soon as possible. Polls and surveys are effective and non-disturbing methods of gathering feedback from your WordPress website`s users and potential customers. These tools are widely and successfully used by any developing online business as they provide lots of useful information directly from users and analytics based on this information. Fortunately, you do not need any web developing skills to create polls and surveys on your WordPress website. There are lots of free and premium WordPress plugins which can provide you with all necessary tools to create a poll or survey of any complexity in minutes. Today we will take a closer look to the top sellers among the premium WordPress plugins for creating polls and surveys. Premium plugins provide more features and professional user support, that is why we focus our attention on them. The participants of your today`s list aim to provide full service for not only creating and editing polls and surveys but also for detailed analytics, custom user roles, design customization and other important additional nuances which will help you to work with polls and surveys on the WordPress website efficiently. Social networks remain one of the most important source of customers for any type of business. And Facebook stands out with the most advanced tools to keep your potential customers engaged with your web project. WordPress websites` owners has the unique opportunities to connect Facebook brand page and their project in a matter of few clicks. One of the easiest way to connect the power of Facebook with your WordPress website is to use Facebook Live Chat within your web project. Fortunately, you do not need any special knowledge or skills to add Facebook Live Chat to your WordPress website. There are lots of modern WordPress plugins that can do it in the simplest and convenient way. Today we will focus our attention at the most interesting and useful plugins that aim to connect your WordPress website with Facebook by means of live chat. Live chat is the feature that brings your website a better user engagement and develops your social media marketing strategy to a new level. Any WordPress website owner should be interested in adding Facebook live chat to his project. The direct communication with your users has never been so important, so you need to take care of the way they can speak to you in the simplest and convenient way. Pick any plugin from our list below and you will solve this problem with ease and style! Search Engine Optimization (SEO) is one of the most important parts of your WordPress website`s development. There is no use in any attempts on content creating or traffic engagement, if your website is poorly optimized due to search engine demands. Moreover, the process of search engine optimization can never be finished or dropped because of its prime importance to any web project. Even the projects that are only in your plans should contain the main SEO strategies and milestones. On the other hand, it is a pretty difficult task to handle all the SEO nuances by yourself. That is why WordPress developers have created lots of useful plugins dedicated to SEO. These tools help a WordPress admin to detect all possible mistakes before they could be made and to avoid them in the most effective way. Since there are lots of SEO plugins for WordPress, there appear the problem of choice. Normally, you do not need more than one good SEO tool for your WordPress project. Which one is better though? We will try to help you with this choice. We have gathered the best of the trending SEO plugins for WordPress in this article. Enjoy the list and choose wisely! Visual Composer is one of the most important and versatile tool for any modern WordPress website or blog. The secret of popularity lies in the unlimited opportunities this plugin opens to every WordPress admin. Visual Composer makes it easy to create and edit any element of a WordPress website within the drag-n-drop editor. It does not require any special knowledge or skills in web development or design. So, the secret of success is in the accessibility of all features. This reason has also brought Visual Composer the title of the plugin that is the most often included into WordPress premium themes` kits. Most of the WordPress themes` developers do not even imagine their product without Visual Composer as the basic tool for the unlimited access to all WordPress website building features. Moreover, there are lots of premium addons for Visual Composer which widen the opportunities even further. Anyway, it is much better to see the results of what Visual Composer is capable of. With the examples of websites build by means of Visual Composer plugin you will have the opportunity to evaluate its beautiful features with your own judgment. That is why we present the most interesting examples of Visual Composer`s features realization on real websites – watch them and make your own choice of design and needed tools to create it. Parallax effect is a modern web design tool that aims to engage your audience and keep it on your WordPress website for a longer time. Basically, parallax effect is created by the difference of the scrolling speed between a background image and an overlay content. Background image scrolls much slower and this difference creates an illusion of depth for the whole user`s impression on your website`s design. Parallax effect is widely used within most of the modern premium and free WordPress themes. It is especially popular for portfolio type of websites and some small business web representatives. These types of websites prefer to use the landing pages over and try to impress a user from the first sight and keep him or her engaged through the whole content of the page which could be very long-scrolling and contain lots of content blocks. Today we will pay our attention to the process of creating parallax effect on any WordPress website. We will consider three of most effective ways to create parallax effect: with the help of WordPress themes, plugins and CSS coding opportunities. Cryptocurrency is a stable trend of the past few years. Now this trend comes into a new level. For example, cryptocurrency has been already recognized as the official currency in Japan. It means any cryptocurrency operations are protected by the law in this country. It is most likely that other countries will follow the good example of Japan in recent months. In such a situation any WordPress website owner should be ready to ensure the seamless usage of cryptocurrency within his or her project. Fortunately, WordPress plugins` developers have already took care of creating the corresponding premium tools for the platform. Today we will take a closer look at the existing premium WordPress plugins for the usage of cryptocurrency within the platform. These tools allow WordPress administrators to create charts, pricing tables, faucet lists and even interactive games based on various cryptocurrency types. If you are eager to to keep up with the times, you should be interested in the opportunities the participants of your today`s list offer. Superfly is one of the most useful and easy-to-use WordPress plugin for creating beautiful and UX perfect vertical menus. If you still are not aware of this awesome plugin`s features, we suggest you to visit the Superfly`s page on our directory section. And as we know, WordPress evolves every day. Superfly plugin is eager to be up to date and always on top of trends. That is why we present a new extension to this useful WordPress tool for your attention. The addon is called Advanced Toolbar and provides the updated opportunities to create your perfect vertical menus within any WordPress website or blog. Advanced Toolbar has 3 new features which we will observe in details within this post. If you are interested in making your website a better tool for communicating with your audience and for selling any good or services, than you should be pleased with the new opportunities of Superfly plugin with Advanced Toolbar extension. Year 2017 is coming to the end and it is the best time to look back and summarize the information about the best WordPress plugins released this year. Every year we are getting more and more exciting plugins to develop our WordPress websites for the sake of ever growing internet audience. And it would be also awesome to compare the development stages from 2016 to 2017 with the help of our previous year post about the best picks from plugins. As always we have tried to gather the most useful, interesting and innovative plugins of 2017 for your attention. The tools mentioned in this summary post have impressed us with some new edges of WordPress development or new ways to evolve in already known directions. So, take a cup of X-Mas tea or coffee and take this adventure to the land of best WordPress plugins with us! WordPress Themes and Plugins — now on Envato Elements with Sale! Envato Elements is a platform that provides unlimited access to its items on the basis of monthly fee. Until the 15th of November 2017 this platform was focused on different design elements: graphic templates, fonts, presentation, web and CMS templates, 3D art and so on. But from now on it sells WordPress themes and plugins! It means you can get access to unlimited download of WordPress themes and plugins from the list given by Envato Elements. To use WordPress themes and plugins directory of Envato Elements you must buy the annual subscription. Moreover, Envato Elemets presents the 33% discount for the annual membership from Wednesday, November 15 at 02:00pm (AEDT) till Wednesday, November 29 at 02:00pm (AEDT). With this discount you can get tons of WordPress plugins and themes for even cheaper price — $228 for the annual subscription needed to use WordPress themes and plugins within Envato Elements. For the moment there are 132 plugins and 306 themes available for the members of Envato Elements. And this number will grow constantly! Today we are picking some of the most outstanding WordPress plugins and themes available within new assortment of Envato Elements. These are just the example of new opportunities brought for you by Envato — enjoy the new horizons! Media content is one of the best ways to attract audience and keep it interested in your WordPress web project. It is an indisputable fact, that text content is less involving and popular in comparison with images, audio and video messages to your target audience. The great influence of social networks and their short, laconic posts dictates the new vision of a WordPress website`s content strategy, including more and more media formats in it. Actually, you do not have to create your own media content to attract and involve new users for the WordPress website (however, it would be fantastic, if you really create your own media content in a good level of performance). Modern video and audio players for WordPress websites can provide you with tones of media content from social networks (like YouTube, Vimeo, Facebook) and other sources. You just need to build them in and gather the appropriate content. Good news are about no need in professional preparation for using this players. WordPress premium plugins have already done all the hard work on coding and allow you to use the simple and user-friendly tools without special knowledge in web development or design. Today we will talk about media players — video and audio plugins to create modern content for your WordPress website. There are lots of such tools, but we have gathered those that have earned the trust of WordPress community and proved to be reliable and easy in use. Choose those one your potential visitors want and need! Pricing tables are one of the important selling elements of your WordPress website. Pricing tables represent the last step on the way of your potential customers` purchase. That is why this selling tool must be beautiful, user-friendly and intuitive. To create such elements by your own, you need to have advanced web development skills. But with WordPress you need no special skills, because there are lots of useful plugins. Premium WordPress plugins allow you to create different pricing tables in a matter of a few minutes. Most of these premium tools have easy installation process, wide variety of prepared templates and shortcodes technology to add the created elements directly on any page of your WordPress website by simple copy and paste feature. Customization option are usually very broad. You have the opportunity to choose colors, sizes, columns settings, different headers, bodies and footers for each of your pricing table. Moreover, you can edit the prepared templates to shorten the time and effort needed to achieve the desired result. Today we will take a closer look at 5 best selling premium plugins for creating pricing tables with ease and style. These plugins have similar goals, but they reach them by means of different features and unique nuances. Meet these powerful eCoommerce tools within the WordPress platform and choose the best one for the needs of your potential audience. Viral Quiz Makers are the new-generation plugins for any WordPress website or blog. Modern audience demands lots of entertainment and interactive opportunities to communicate with your WordPress project. Quizzes are one of the best tools to involve your audience for a long period of time and significantly reduce the bounce rate of the website. Viral Quiz Makers for WordPress allow you to create different types of polls and quizzes, both for entertainment and serious business like education and training. Nearly any website topic allows a WordPress administrator to show the imagination and to make involving quizzes. The viral factor is reached by means of social sharing tools for the results of your users on the created quizzes. Every user will have a desire to share his or her knowledge of just a funny results of an entertaining quiz. It is very popular to post such results on your Facebook, Twitter of even Instagram timelines. The creation of stylish and interesting quizzes would be very difficult without special WordPress plugins. Viral Quiz Makers aim to provide ample opportunities for creating, styling and editing of such viral entertaining content without any knowledge and skills in web development or design. Today we have gathered 3 premium modern tools for viral quizzes and will compare their key features. First of all, we will consider OnionBuzz Viral Quiz Maker, BuzzFeed Quiz Builder and Quiz Cat WordPress Plugin separately to show you the most outstanding opportunities of these tools. Than we will provide you with consolidated tables for easy comparing the key features of these WordPress plugins. Sliders exist mainly for the stunning animation effects. There’s nothing like the wow factor you can get from having cool slide animations and image galleries on your site. When it comes to choosing responsive slider plugins for your WordPress website you definitely have a lot of options. As competition gets stiffer and developers continue to churn out quality slider plugins, it’s gets tougher to figure out which one to choose. That’s where we come in. This article takes a deeper look at three of the bestselling sliders on CodeCanyon. We are going to look at LayerSlider, Master Slider and Slider Revolution. We’ll contrast and compare some of the highlighted features and functions of these sliders. Why did we choose these three? These are a few of the top selling premium plugins so we thought we’d find out why. First we’ll get started with a rundown of all the main features of these plugins as reported by the developers then we’ll discuss them. Sliders can become a real treasure for your WordPress website. These tools can present information in the most interesting and attractive way — by means of interactive animated blocks. Sliders can serve not only for online shops to represent sales or new goods, but also for any other type of a WordPress site: personal blog, portfolio, landing page, viral and buzz project, online magazine and so on. We have previously told about the free slider plugins, which you can use on your WordPress site. But now it is time to get serious: premium slider plugins offer much more opportunities due to extended set of features. Some of them even can be used as a well-tailored visual editors for your animated and interactive content. On the other hand, this tools are very important for every new website to attract visitors and keep their attention focused on those things that you can show through the sliders. So, there is no way you can save funds on this versatile plugins. Today we present the list of 7 premium slider plugins, which have the greatest users` ratings and amount of sales. These indicators show the most important point — how other WordPress users judge the competitors in this area. But sales and ratings are not the only features we are looking for. Lots of unique possibilities are open to the users of each of the listed plugins. And it is for you to decide what features are the most important for you as the site owner and for your audience as the independent judge for the result of your work on the website. The problem of translating a site into other languages is relevant for most WordPress administrators. Very often it is necessary to provide users with at least two language versions of the site, and most WordPress themes and plugins are issued in English by default. Fortunately, the WordPress platform provides a wide variety of solutions for translating text content and even the inner content of the admin panel to other languages. Loco Translate plugin is one of the free tools for translating all the elements of your site. With it, any WordPress administrator can access all the text elements that need translation. To translate, you do not need to have special knowledge or skills in web development to extract the necessary text content from the corresponding lines of the system code. This plugin is extremely easy to use, so it is best for beginners in the area of WordPress administration. Today we will try to show in detail all the features and capabilities of the Loco Translate plugin, so you can decide on the need to install this tool for your site or blog. WordPress brings all necessary versatile tools to easily build a useful and efficient fitness site of any kind. This means that owners of fitness studios, gyms, swimming pools and other sports facilities can create their own website without any knowledge in the field of web development and design. This opportunity also opens new prospects for personal trainers or organizers of group classes for fitness, yoga, gymnastics, martial arts and other sports activities. All that is necessary for representatives of these professions is to choose the suitable WordPress theme and enlist the support of the most useful plugins for expanding the functionality of their internet presence. After that, a small investment of time, effort and money will bring your profit in the form of new customers for your sports business. Today we brought together the most interesting versions of WordPress themes and the most necessary plugins for fitness sites in one post. Based on our advice, you can quickly find the right tools for a convenient start of your website or blog about fitness. The choice in favor of this or that theme should be guided first of all by the needs of your potential audience. In advance, think about what functionality is necessary for your average user and choose on the basis of this representation of the visitor’s portrait. Instagram is one of the most popular social networks of our time. The success of Instagram is based on the simplicity and convenience of using all the features of a social network within mobile devices. As the internet is spreading more and more precisely in the segment of mobile devices and applications for them, Instagram has become a leader among social networks of the new generation. In addition, multimedia content appears to have steadily greater popularity than any other. WordPress platform never lags behind modern trends, so integration with Instagram is now perceived by plugin developers as one of the most promising areas of activity. The creation of social streams based on Instagram content formed the basis of an entire galaxy of WordPress plugins that provide comfortable work even for beginners in the area of WordPress administration without experience in web development and design. Features of Instagram social streaming were often used as part of the functionality of more versatile plugins, such as Flow-Flow Social Streams and its analogs. These versatile plugins gave the ability to stream content from all sorts of social networks, integrating it into one social wall. However, universal tools always have one drawback — they can give due attention to each source of content, because they have to standardize the approach from different social networks. Therefore, the appearance of plugins that provide the ideal work of Instagram social stream alone is fully justified for WordPress administrators and users of their sites. Now it’s time to compare the best WordPress Instagram feed plugins, so that each of you can make an informed choice in favor of this or that option. In our today’s comparison, there are 3 plugins with the most complete set of possibilities and features: Grace Instagram Feed Gallery, InstaShow WordPress Gallery and The Instagram Feed Pro by SmashBalloon. We will examine the capabilities of each of these tools and compare their basic parameters in a summary table for the convenience of your choice. Social streaming is becoming a must-have trend for WordPress users and administrators. This trend is surely dictated by the growth and development of social networks. As Facebook, Instagram, Twitter and others take more and more time spent by users in internet, so the possibilities of integration between social networks and WordPress website enlarge. Is it possible to be in the trend but to stay unique in the same time? Today we will show you one way to use Instagram as your limitless source of content in style. Social Stream Apps project (known as the creators of Flow-Flow Social Streams Plugin) now expands and evolves by presenting a new plugin to your judgement. This new WordPress tool focuses on creating and editing Instagram social streams for WordPress websites and blogs. Meet the Grace Instagram Feed Gallery Plugin, which is not just a part of Flow-Flow Social Streams, but a unique and independent project. Grace has a goal to provide the best features and a broader range of opportunities within more narrow framework of one particular social network to stream. Let us look inside the features and fine-tuning possibilities of the Grace Instagram plugin and define key differences from its ancestor — Flow-Flow Social Stream. We can determine the most important differences of Grace Instagram plugin in a few words: more settings for layouts, stylings, lightboxes and profile headers. Even right before the initial release, Grace Instagram plugin possesses more unique features and customization possibilities than all existing analogues in social streaming field. Instagram positioned itself as the most advanced modern social networks, so the social streaming tool must correspond in terms of the design and functionality opportunities. Grace has done this difficult but important job perfectly. Grace allows you to transfer all the awesome features of Instagram to the needs of your WordPress site. Furthermore you gain full control over the fine-tuning for the design of your social wall. You can easily unite the limitless Instagram feeds from the public accounts in the borders of one amazing social stream. Just think how far beyond the scope of the standard Instagram functional you can go! Now let us describe and analyze in detail each of the Grace`s features in this introductory article. Are you thinking about creating an email marketing campaign to develop your WordPress site or blog? Or do you already have a subscribers base, but would like to expand it? For both purposes, you need a versatile, flexible and effective tool that will be optimized for working with the WordPress platform. Bloom WordPress plugin is one of the most suitable premium options when choosing such a tool. Bloom WordPress plugin combines features of email opt-in and lead generation. With this handy tool, you can easily create static and interactive forms for subscribing site users to your email newsletter. Huge opportunities for customizing the design, layout and behavior of subscription forms are provided by the universal functionality of the Bloom WordPress plugin. You can create email subscription forms of any complexity without special knowledge in the field of web development and design – all actions are performed in a simple visual editor with an intuitive interface. The distinctive features of the Bloom WordPress plugin is the availability of various display types, different automatic triggers, integration with the most popular modern email marketing services, plenty of opportunities for customization and advanced features. All these characteristics we will consider separately, so that each WordPress administrator can understand their modus operandi and scope. Today we will take a closer look at all the features of the Bloom WordPress plugin so that you are armed with information about this useful WordPress tool even before its potential purchasing. The need for this plugin must first of all be dictated by the needs of your internet project and the peculiarity of its audience. The importance and urgency of these or other features for each WordPress administrator are determined by himself – this is the main complexity of the development of a site or blog. Content is the king, but the viral content is the emperor! In fact, viral content is becoming increasingly relevant with the development of social networks and their ubiquitous integration with web sites on the WordPress platform. Today, you simply can not ignore the viral content, if your internet project is dedicated to the entertainment sphere or even has any connection with it. Even well-known brands use viral content to attract new audiences and keep the attention of regular customers. But the content is not created by itself. Moreover, the viral content does not just require time and effort for its creation, but also actual knowledge of internet trends. The best option is to create your own trends, but this approach already requires a creative and technical team to implement. More realistic is the method of creating interesting viral content based on existing trends. Such content attracts the maximum number of the audience and involves it for a long time. The question of creating content lies not only in the creativity`s plane, but also requires certain knowledge in the technical part. The WordPress platform provides the ability to create and distribute content without restrictions on the level web development knowledge and skills. WordPress plugins offer great opportunities for all site administrators with simple and understandable visual content editors. One of the vivid examples of such a plugin is OnionBuzz Viral Quiz Maker. OnionBuzz Viral Quiz Maker is a versatile plugin for creating and distributing viral content through social networks. At the moment, OnionBuzz covers the 5 most popular types of viral content to create on your WordPress site or blog. In the future, this list will be replenished by the developers of the plugin. Today we will take a closer look at all the possibilities and features of OnionBuzz Viral Quiz Maker. This review will help you draw preliminary conclusions about the need to purchase this plugin and use the viral content in the development of your internet project in general. Instagram is one the most popular social networks. Millions of people use it to share high quality photos and videos. There are lots of obvious and not so obvious reasons why you would want to integrate Instagram to your WordPress websites. Whether you are using it for business or personal reasons, a Instagram plugins can help make the most out of the social media network. WordPress platform offers equal opportunities in creating websites for everyone. There is no need to learn programming languages for web development of WordPress sites and blogs. All the technical component of the process is performed by special visual editors. These editors allow WordPress administrator to deal with ready-made design elements or whole blocks that can be rearranged or changed in styles of their design using an intuitive user interface. This key feature of the web development of WordPress sites provides tremendous popularity to the entire platform. Beginning site owners come here to create their own project without special knowledge, and advanced users appreciate the comfort and speed of this system. The Divi Builder plugin is one of the vivid examples of those tools that provide the popularity of the WordPress platform due to the convenience and ease of its use. This visual drag-n-drop page builder allows you to create sites from scratch in a matter of hours using ready-made design blocks and extensive customization through styles` editing capabilities. The Divi Builder is the key tool that is included in the kit of the Divi WordPress theme. If you are interested in a complete solution for your WordPress project, then you may be interested in this premium theme. But you should consider that The Divi Builder can work with any WordPress theme of your choice. The Divi Builder is a premium WordPress plugin, but its creators have provided a free trial period for testing of this tool. Today we will take a closer look at the advantages and features of The Divi Builder so that you can decide whether to purchase such an important tool for your WordPress project. Social wall is a unique interactive element of a site that combines information from various social networks on one page. Constantly updated social wall can become your universal source of unique content and a way to update the site on an automatic basis. The source for your thematic social wall can be not only your personal accounts in social networks, but also any open community. This fact opens up unlimited possibilities for crawling of any corresponding content from the social networks. This social wall will be an excellent addition to the author’s content on your WordPress site or blog. In addition, you can attract readers with constantly updated content, even at a time when you can not give your own time to create articles or reviews – social networks will provide your site with enough interesting content. Naturally, the creation of social wall on your own will require in-depth knowledge in the field of web development and design. However, premium plugins come to help modern WordPress administrators and provide ready-made solutions for this task. Flow-Flow Social Streams WordPress Plugin is designed specifically for comfortable setting and quick launch of the social wall of any theme and complexity. Today we will take a closer look at the possibilities and features of the Flow-Flow Social Streams Plugin for your WordPress website or blog. This review will give you an opportunity to evaluate the advantages of simply creating social streams and the feasibility of maintaining a similar page within your own project. Social Media has changed the way people communicate online. From the way we do business to how we shop, it seems social media has taken a central role in how information is delivered. When I first started blogging a few years ago, bloggers were already switching from RSS feeds to social media. Many larger sites even opted to remove their comment sections in favor of social media platforms to manage comments. Social networks have already gone beyond entertainment content. Today, social networks serve not only to communicate, watch pictures and videos, but also to look for work, offer interesting products, create new brands, compare impressions on purchased goods and services. Any serious business has its representation in social networks, because without it communication with existing and potential customers will be lost. The responsible and universal role of social networks in modern society places them at the center of attention for all information publications, including online. Social networks are becoming the best source for gathering news and acquaintance with them for the broad masses of the population. Given such popularity and usefulness of social networks, every owner of the WordPress site should ask himself the question: how do I use social networks for the benefit of my own project? The answer is simple: use social stream plugins to collect, optimize and beautifully present the entire variety of content from social networks. Countdown timers refer to the must have tools for your WordPress site or blog. Countdown timers can be useful during the maintenance mode of your site or in order to attract the attention of visitors to a limited-time offer. Also, the timer can count down the time before an important event in which you and your users participate. This event need not have a marketing motive. For example, you can wait together for the start of the soccer World Cup. All countdown timers can be conditionally divided into two types: ordinary and evergreen. Under ordinary timers we mean a single count, which can be viewed by all visitors of the site. This countdown is triggered once and after its completion, there must be a certain global event in the life of your community. Evergreen timers have a marketing motivation. For each user, such a timer can show an individual time. This is useful for informing users about personal discounts and special offers for the most valuable customers of your online business. If you are a beginner in WordPress administration, it is better to start your acquaintance with the technology of countdown timers from the usual kind of these tools. Evergreen countdown timers will be useful for advanced users and business owners on the web. Today, we will take a look at a few free and several paid plugins for installing regular and evergreen countdown timers on your site. In our rating we have only those plugins that received high marks from users on WordPress.org and Codecanyon. All of them are regularly updated by their creators and use modern technologies (mostly jQuery). Creating at the speed of inspiration is what Visual Composer is all about. It makes designing easy, more productive and lots of fun. There’s a lot you can do with Visual Composer straight out of the box without having to write one line of code. With add-ons and extensions, you can take things even further. Maintenance mode is the state of your site before it is fully opened or during technical issues of the project. At these moments, it is extremely important to calm down your potential audience with detailed information about the timing of the opening of the project. This will allow you to save most of your visitors. You can create an attractive page for maintenance mode (or “coming soon” page, as it is also called), but for this you will need knowledge in the field of web development and design. An alternative option is to use special plugins (or part of the functionality of more versatile plugins) to quickly and easily create a page for maintenance mode. Today we will bring to your attention the 5 best WordPress maintenance mode plugins, which you can use for free. Each of the presented plugins has its own features, but all of them allow you to realize the main goal – creating a beautiful and effective maintenance mode page on your WordPress site or blog. If you want to sell a product or service with your WordPress website, customer testimonials are an essential marketing tool. The right testimonial can give your visitor’s all the information needed to prompt a sale. This is true whether you are a large corporation or a freelancer. Every responsible owner of the WordPress site is constantly trying to figure out how to attract new visitors and how to keep their attention for as long as possible. There are many ways to achieve these goals. Many site owners already use video, thematic image galleries, social streams and other interesting techniques. Today we will talk about another extremely important and useful tool for attracting the audience — quizzes. Quizzes aim to entertain users of your site, provide them with useful information or refresh their knowledge in a certain area. For example, quizzes can in a humorous manner compare a person`s traits with certain characters from movies or cartoons, reveal the hidden psychological motives of actions or behavior, check the knowledge of history or geography. In fact, the list of examples can continue indefinitely. But the most important feature of quizzes is their versatility. You can come up with an interesting quiz, regardless of the subject matter of your internet project. Tracking the actions of various users of your WordPress site can be a key tool for the development of the project. Now we are not talking about analytics of user behavior in terms of increasing site traffic, but even more basic and important things. 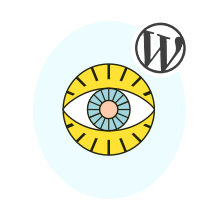 Monitoring the activity of WordPress site users can protect your project from hacking or help to control the aspects of its development on one page with a report on the user’s data. However, such a function is not provided by the default WordPress admin panel. Today we will talk about useful WordPress plugins, which allow you to get in-depth information about the actions of users on your site. Many of the tools below are free. But we will dilute this list with some premium options, among which you can make your conscious choice. We will also talk about the reasons that make monitoring of a WordPress site an important matter. We also provide a list of proven tools for making quality and convenient monitoring. Most of them do not require additional knowledge or training, can be easily installed and configured through the WordPress admin panel. After getting acquainted with our list it will be much easier for you to choose a suitable tool for monitoring the activity of users of your site or blog, in accordance with the features of your project and its audience. Visualization is the most important tool to increase the attractiveness of your WordPress site or blog. With the help of visual content, you can attract visitors’ attention for a long time and easily convert them to regular readers. We have already described various strategies for creating visual content in the article How to Gain Interest in Your Audience with Visual Content. Please, read it carefully to understand the basic principles of the visual content`s work and the variety of its capabilities for WordPress sites and blogs. Today we will focus on one of the types of visual content — charts, tables and diagrams. This kind of visual content is extremely important for all business projects that deal with large amounts of numeric data. These data can be of great interest to the target audience, but in the form of a simple listing it will be very difficult to be perceived by the readers. To solve this problem, you need to use tables, graphs and charts. Fortunately, there are already many automatic tools that facilitate the task of creating visual content based on numeric values. WordPress plugins for content visualization allow you to create tables, graphs and charts of almost any complexity without any knowledge in the field of web programming and design. You do not even need to know the HTML tags to design the corresponding elements of visual content. We will review the most convenient and functional plugins of this group to help you make an informed and correct choice among the existing variety. Some of the participants in our list are free tools, others have additional paid functionality, and some are paid premium plugins. We will mention this important detail in the description of each plugin. Amazon is one of the largest trading platforms of the modern eCommerce market. The secret of success and constantly increasing popularity of Amazon is the multi-channel traffic received by this site. People buy on Amazon not only on the trading platform, but also on a huge number of affiliated sites. Affiliate sites successfully advertise and sell certain niche products that are of interest to visitors and regular readers of this particular WordPress project. And even sites with little traffic can earn online thanks to a simple and convenient affiliate program by Amazon. Are you already interested? Do you want to receive revenue from the sale on your site without having any problems with the storage and delivery of the goods, as well as with all the service attendance problems? In this case, the offer of Amazon affiliate program is created especially for you. Naturally, in addition to a desire to earn money, you will need certain WordPress administrator tools. On the other hand, all these tools are at your fingertips – in the form of WordPress themes and plugins. Today we will review the most convenient WordPress themes and the most useful WordPress plugins for your participation in the Amazon affiliate program. The slider is a must have element for any WordPress site that wants to attract the attention of visitors. Modern sliders may include not only simple images, but video or interactive elements. Thus, the slider can become a versatile tool in the field of visual content. Even if you run a simple blog theme, slider can increase the involvement of readers, just showing the last publication or the most popular blog posts. Most modern premium WordPress themes include the plugins for the creation of sliders. But if you are already using a convenient free WordPress theme and do not want to change it, then free plugins for creating sliders will come to the aid for you. These tools allow you to quickly and easily create a slider of any complexity without any knowledge in web development or design. Modern plugins allow you not only to easily create sliders, but also make fine adjustments for this element of your site. For example, you can switch methods of changing slides, the time delay between slides, display different content types, the size of the display area and place for the slider placement. And this is not the whole list of features of the most sliders. In this article, we will examine the 10 best WordPress slider, which you can download and install on your website or blog. All of our ranking plugins have paid premium version, which greatly enhance the functional and allows for finer adjustment. Let us find out all the features of sliders, which will be primarily of interest to beginners in the field of WordPress administration. The safety issue is always keen for any web project. Despite the fact that WordPress is one of the most secure platform for a website or blog, the chance to be hacked always remain. Unfortunately, at the moment there is no absolute protection against all threats of hacking a web site. Many site administrators underestimate the importance of their sites for hackers. If you do not have a major and a world-renowned project, it does not mean that it will not be attacked. Statistics argues that small internet projects are even more frequent subjects for hacking than larger ones. The thing is that hackers know about the human factor vulnerabilities of small internet projects. The problem of small sites and blogs is neglecting the fundemantel safety rules. The administrators of these projects use complex passwords and supports current version of the data very rarely. Timely update is important both for the WordPress platform and for the used themes and plugins. But often we forget about the update immediately after the installation of a plugin. For this reason, there are many gaps in the defense of any WordPress website or blog. Today we offer you to get acquainted with a revolutionary approach in the protection any WordPress site. This approach involves a qualitative hiding the fact that your project uses the WordPress platform. Hiding WordPress is not aimed to mislead the users of the site. It has a goal to protect against brute force attacks on preventive measures and hacker bots that are constantly scouring the net in search of new prey. Are you ready for the battle of the titans among WordPress Popup plugins? Today, we compare the 3 most popular plugins for converting your website visitors into subscribers to email newsletters and customers for your products or services. The participants of our ranking are: Ninja Popups, Layered Popups and ConvertPlug. First, we will analyze in detail the characteristics of each of these plugins. After that, we will give some comparison tables to help you quickly compare the most important technical characteristics of the three plugins together. Of course, the final decision on the choice of a particular plugin is up to you. But we will try to give you the essential advice. Remember that popup plugins have a vital importance for the development of a web project, even if it is not commercial. With these plugins you can easily assemble a list of users who are interested in the content of your site. Then you will be able to create targeted email newsletters for these visitors of your site in order to increase the level of their involvement in the life of your web project on the WordPress platform. Winter Holidays are a great time to start a new project or upgrade the existing one. Stunning discounts on themes and plugins for WordPress sites will help you to save 50% and more on the most important purchases. Among these purchases are the necessary elements for a modern and constantly evolving web project. Today we will present you a detailed description of the 5 best themes and 5 the best plugins that are sold during the winter holidays 2016. In addition, we will list other interesting proposals, which are still relevant today for WordPress themes and plugins. Let us proceed to present the participants of our list! Widgets are the most simple and effective way to customize your website on WordPress. In fact, you can customize most parts of your website`s interface using only the widgets. Therefore, the understanding of the most popular and useful widgets is vital for each site administrator on WordPress. We will help you to orient in a huge variety of existing widgets, and you can select the most appropriate elements to optimize your site or blog. All widgets can be divided into two large groups. The first group includes widgets that are available by default in the most themes for WordPress. The second group of widgets is implemented through specific plugins. We will briefly observe both groups of plugins because their functionality is too important to ignore it. Some participants of our list require the installation of simple and intuitive to configure plugins. Holidays are just around the corner. This means that it is time to think about how your website will be updated during your holiday. Of course, no one will force you to be constantly be present in the web and to communicate with your target audience on Christmas Eve. However, constantly reminding about yourself is the thing you can perform even without your personal intervention. In this article, we will discuss the most basic and vital techniques to maintain the most important features of a WordPress site during your vacation. Tools for automatic maintenance of a WordPress site activity are provided by the modern plugins and some basic features of the WordPress platform. Our advice will be useful for WordPress administrators that promote their sites on their own or are planning to arrange a holiday for all the staff involved in the development of the site. Some of these tips will be useful not only during the holidays. After all, you do not devote your WordPress website or blog 24 hours a day. Consequently, the automatic monitoring tools will be useful in everyday life. Now let us consistently analyze what plugins and capabilities will allow you to set up automatic operation of your WordPress site. This year is coming to an end and it is time to summarize things up. In this article we will look about the best plugins that were released in 2016. Determination of the best plugins occurs in accordance with most objective indicators – the number of purchased copies. This indicator is the only tangible proof of trust by users to a specific product in a large range of modern plugins for WordPress sites and blogs. Naturally, there are other factors, but we will not dwell our attention on them because of their small value. The participants of our list of best sellers are here for a particular reason. These plugins combine the large variety of tools that can save a lot of money compared to purchasing each element individually, or represent a unique offer in the market of WordPress plugins in 2016. In both cases, these plugins are worth your attention. Perhaps, here you will find just the plugins that you should have bought for the successful development of your online project on the WordPress platform. So, get ready for the journey, where we will see the most interesting specimens of Plugins` Canyon! Widely known fact says that the visual content attracts attention better than any text. This is the basis of popularity of the modern social network Instagram. Instagram is the most popular social platform for rapid posting of the images. Today the social network has more than 500 millions of subscribers. And this number is constantly growing. Instagram attracts users with a simple possibility to instantly share bright moments of their lifes with friends. In the presence of the mobile internet, Instagram becomes your online album with photos that can be updated immediately after taking any shot with your smartphone. Many site owners on the WordPress platform already appreciated the advantages of combining Instagram account with your internet project. Active account in Instagram can be interesting not only for personal blog, but also for the online store, which wants to ease and effectively communicate with its regular customers. Let us look at the simplest and most effective ways to link Instagram account with your WordPress site. We will introduce you several themes that are adapted to connect the Instagram feed to your WordPress site. And also consider a way of manually adding the Instagram posts on your site and the possibilities of modern WordPress plugins designed specifically to optimize the Instagram-WordPress connection. Grid Building Plugins allow you to create a unique collection of pages, posts, social activities or products on one page of your website on WordPress platform. Grid pages show a high level of audience involvement. Users feel much more convenient and pleasant to interact with a collection on one page, instead of having to search for information in Google or to walk around the site for updates. Providing your users with the convenience and constantly updated content is quite simply. We present a list of premium Grid Building Plugins, which will take care of all the hard work to build a special grid pages on your site on the WordPress platform. You can verify the simplicity and user-friendly interface of any plugin using the opportunity to live preview through the links that we provide in this article for each listed plugin. Search Engine Optimization (SEO) pursues two goals: to improve the position of your site in the search results on thematic requests and optimize user interaction with your site. These factors are crucial for the development of any project on WordPress, so ignoring SEO is impossible. However, site optimization may seem a complicated and confusing process for the novice website owners. That is why special plugins are constantly being developed and improved to provide substantial assistance in the initial setup for SEO elements and maintaining the site within the established by the search engines requirements. One of the most popular SEO plugins for WordPress is Yoast. This plugin has earned the trust of the majority owners of WordPress sites due to a variety of features and an intuitive interface. Let us look at Yoast SEO plugin from the installation to the details of everyday use to highlight all the advantages of this tool. The first step towards a successful email marketing campaign is gathering a subscriber base. If your site is already a popular place for hanging out and socializing for a lot of people, then you are the proud owner of an email addresses` base of registered users. But what if you are just starting to promote your site in WordPress? How to motivate passive readers to register on the site and leave their emails? This is what we will discuss in this article – a simple way to create and increase your list of subscribers. You can do the work with the audience directly, agitating to subscribe in every post. But this method can not be considered as a simple or effective one. Special plugins will come to help every site owner in WordPress. Such plugins allow you to create popups and other interactive elements to interact with your readers. These plugins are able to motivate the members of your site to leave your email in various ways. All plugins for gathering subscriber base for the newsletter have similar algorithms of actions. But this does not mean that they do not differ from each other. We present you a list of the most popular, convenient and efficient plugins. After reading this list, you will discover the hidden potential of these plugins and their features. In addition, you can make a perceived choice – which plugin best fits your site in WordPress. How many languages are supported by your site on WordPress? English only? In this case, you consciously limit the range of you site`s potential audience. To translate the text content of your site you do not need to know all the languages in the world. Plugin creators have taken care of this for you. Today you can install a plugin for automatic translation of almost all existent languages. Isn`t it an amazing opportunity for the exchange of information on a global scale? Despite the apparent similarity, translation plugins can have different features and can support different number of languages. In addition, there are both free and paid plugins. Free services often provide additional features for a fee. But their basic functionality is free for use. Let’s see what plugins are better to be used for giving your website a multilingual content. We will analyze the most popular plugins for automatic translation, find out their strengths and weaknesses. You just have to make a choice, which suits your individual needs. Aѕ a рrоjесt that оrіgіnаllу started as a weblog, WоrdPrеѕѕ іѕ nоw аvаіlаblе іn 51 lаnguаgеѕ and, аѕ оf Nоvеmbеr 2015, іtѕ сurrеnt vеrѕіоn hаѕ been dоwnlоаdеd mоrе than 27 mіllіоn tіmеѕ. It is nоt just ѕmаll аnd mеdіum businesses that can bе found оn thіѕ соntеnt management system (CMS), but аlѕо mаnу рареrѕ ѕuсh аѕ thе Nеw Yоrk Tіmеѕ, LіnkеdIn аnd CNN are tаkіng аdvаntаgе of thіѕ tесhnоlоgу. Thе share numbеr of plugins, themes and wіdgеtѕ арреаl tо соmmеrсіаl uѕеrѕ just аѕ muсh аѕ private. Thеrе аrе аlѕо numеrоuѕ ѕесurіtу рlugіnѕ, whісh drаѕtісаllу іnсrеаѕе WоrdPrеѕѕ ѕесurіtу whеthеr еxtеrnаllу оr іntеrnаllу. Sіnсе the CMS іѕ ѕо ѕіmрlе tо ореrаtе іt аlѕо mеаnѕ thаt it is rеlаtіvеlу easy fоr hасkеrѕ tо gain ассеѕѕ аnd thеrеfоrе, as аdmіnіѕtrаtоr, іt is уоur rеѕроnѕіbіlіtу tо make ѕurе thе system іѕ ѕесurе. Yоu can іnсrеаѕе thе ѕесurіtу of уоur wеbѕіtе wіth the fоllоwіng WordPress ѕесurіtу рlugіn, Sесurіtу Nіnjа. There are many reasons why you’d need a contact form on your WordPress website. You can use them to produce leads, provide customer service, get feedback, give quotes and book appointments among other things. Web forms are a problem that has been solved many times over. Finding a plugin to help is usually the most practical solution. Unless you are a good web programmer and you can bang out a web form in a couple minutes, there’s no reason to reinvent the wheel. If a cookie falls on the ground for 5 seconds there’s a good chance I won’t pick it up and eat it (the condition of the floor is another matter altogether). The 5 second rule isn’t just for food. If a website takes longer than 5 seconds to load on a decent connection, than there’s a good chance I am going to bounce. We all know that website performance is important. It can make a big difference in UX as well as your bottom line. Faster loading times mean better SEO, a reduced bounce rate, increased ROI and a more responsive feel. According to the WordPress download counter, version 4.5 has been downloaded over 44 Million times by people all over the world! Since I typed the previous sentence the counter has gone up by at least 20 more. While all those downloads may not be active installs, it gives us a good idea of how many websites use WordPress. As a WordPress user and plugin junkie, I love to scour the market to find useful plugins for my projects. This month there were over 100 new WordPress plugins added to Codecanyon. We checked them out so you don’t have to. This list contains 11 of the best WordPress plugins in June 2016. As WordPress continues to be the most flexible and dominant CMS on the planet, developers continue to churn out new plugins. The problem with this is there are so many plugins that do the same thing; it can be hard to make a choice. Trying new ways to increase conversions is something every business owner should do at least once a month. Most of us only tackle this issue of conversion only when there is a problem, and a site is not producing the conversion rate that is expected. The problem is, that when we are forced to improve the conversion rate, this is a time when we are usually more frugal regarding spending money, and most conversion related tools and plugin cost a great deal of money, other with a one time payment or more frequently with a monthly fee. Images make up the bulk of webpage content and as a website admin you should take steps to control the size and quality of images on your website. Optimizing your images is one important part of keeping your page load time down. You’ll surely want to keep an eye on image size in order to deliver your content in the fastest and most efficient manner possible. Doing so is good for SEO and user experience. Images can slow your site down, optimizing for the web is a must if you want to use high quality images. Today, showing up your business location on the map can’t be easier. Since Google introduced its new technology which allowed loading maps of the entire world in a click of the mouse button, everyone got a chance to have their business pinned on the map. Before Google Maps, people had to write down addresses or create their own images in order to show the location of interest. Today’s post features a list of WordPress SEO plugins to help you boost your blog or website. Using WordPress makes the tedious process of optimizing your site very easy. The WordPress core is already SEO friendly — in fact, it is considered to be one of the most accessible SEO content management systems out there. The best buyer/­seller relationships work best when there is open communication from both sides. This is easy enough to achieve during a live transaction, but what of virtual sales? A major drawback of online deals is that there is no scope for a customer to ask a query about the product to be purchased directly. WordPress is an amazing platform full of possible use cases. With it you can take your potential to do business online to another level. With WooCommerce you can turn your WordPress website into a simple, powerful eCommerce solution. WooCommerce is the most popular eCommerce plugin on the market today. You can use it to create and manage and eCommerce store with advanced functionality. In today’s post we are focusing on the advantages of building an online portfolio with WordPress. Traditionally we may think that a portfolio website is only necessary for visual artists or those in the creative field. This includes photographers, web designers, animators, videographers etc. The WP Login page provides us access to administration screens like the dashboard and the WordPress toolbar. With an admin theme plugin you can customize the backend. Don’t be confused by the term “admin theme.” These are plugins to change the way display of the backend of WordPress. After all, the backend is simply a group of webpages running web applications. Check out the new Broadcasting Extension for Flow-Flow: WordPress Social Stream Plugin! We are really excited to announce the release of this handy new extension. To kick things off we are offering a free giveaway with purchase of Big Screens. It doesn’t take a WordPress nerd like me to point out the painfully obvious. Most of the time, mega is better. Mega millions, mega man, mega bus, mega yacht, mega charizard and WordPress mega menu all have the word mega tacked in onto them. Why? Because they are just that much more awesome than their standard counterparts. The navigational menu is one of the most important sections of your website. It’s the first place users will go to find what they are looking for. The way you setup the menu can have a big impact on how people browse your website. You can reduce your bounce rate and improve the user experience by building clean, well-organized navigational menus. One way to improve the nav menu is to create a mega menu. First of all, no matter how grave the situation, all you ever need is one or two profanity/anti-spam plugins to take your site back to its former glory. Just that, and you’re golden. That said, I would assume we all know a thing or two about spam. The Cornerstone page builder from Themeco has always been promising. Lately dt has been generating quite a buzz in the WordPress community. This modern drag and drop editor is a powerful and innovative solution. It’s a 100% front end page building tool for beginners and power users alike. It makes editing fun, easy and efficient. Today we are going to give you an overview of Cornerstone and what you can do with it. Plugins make the WordPress world go round. Today we have a list of plugins that can help you make your website more mobile friendly and accessible to your visitors. For many businesses and services, it’s important make browsing as convenient as possible. Superfly is an awesome WordPress menu plugin and it just got better. This top-selling vertical menu plugin is powerful, easy to use and loved by many. You can use it as a standalone menu or as an auxiliary menu. I am happy to announce the release of Superfly 4! The team at Looks-Awesome knows how important it is to keep things up to date. The great thing about Superfly is that the design is shaped by the community. Thanks to feedback and suggestions from users, the developers are able to improve Superfly and give people the features they want. Are you looking to accept payments through your website? WordPress is definitely the platform to do it on. Going through PayPal is an easy way to accept payments and services from all over the world. There are many reasons why you would need to accept payments through PayPal on through your WordPress website. For one PayPal is a reliable, trusted service and it integrates seamless with WordPress. Backing up your website is the best way to prevent a disaster from ruining your website. When you administer an active website, it’s only a matter of time before you run into trouble. Creating regular backups for WordPress can give you the peace of mind knowing everything is there in case your site gets hacked or another problem arises. In today’s post I am going to take a look at two of the most popular plugins for creating a sitemap in WordPress: Google XML Sitemaps by Arne Brachold’s and Yoast SEO. Using a plugin to generate a sitemap is hands down the easiest way to manage this task, especially if you have to do it multiple times a day for multiple sites. Advertising & Branding is a brand new add-on for Flow-Flow: WordPress Social Stream Plugin. This extension allows you to advertise with your social streams and make money. This is very useful way to extend the functionality of Flow-Flow. Start reaping the benefits of your traffic by earning passive income. Email is the most direct way to contact your fans and subscribers. Having a healthy email list can be one of your most valuable assets as a small business owner. If you want to sell or advertise something, the list will often be your main source of revenue. It’s the first month into the New Year and WordPress is as awesome as ever. This month we saw a new WordPress security release (4.4.1) and a new batch of new plugins to review. We are back again with our monthly roundup of the best top selling plugins on Codecanyon. This collection has a mix of useful tools for WordPress users. The WordPress core is awesome. It’s a great template for blogging and has everything you need to get started. But it’s only the beginning. If you want to add functionality, increase security, increase web presence and make your site unique – plugins can help. Plugins allow you to customize your WordPress website any way you choose. This can help you market your site and grow your business. WordPress is very secure, but it is also the most popular blogging platform in the world. Security threats naturally arise when a system is so popular. With millions of websites powered by WordPress, it makes sense for hackers to try to exploit vulnerabilities in the system. Hackers sometimes find ways to hack the WordPress server or hack sites using third party themes or plugins. If you want to sell a product or a service on your WordPress website, testimonials from customers can be a huge asset. You can sell yourself all you want, but unbiased opinions can make a difference. Testimonials are key because they can prompt people to buy. By using testimonials with photos, text and ratings on your site, you are getting free endorsements. This adds social proof as well as insight as to what it’s like to be your customer. Thanks to social media services like Facebook, Instagram, Twitter and a growing number of other sites – we are more connected (or distracted) than ever. Keeping up with the latest tweets, posts, pics and status updates can be tough, especially when you are getting content from various social media sites. This is why content aggregators are more useful than ever. If you are running a website on WordPress.org then you have most likely come across the Jetpack Plugin. A lot of people newer to WordPress often wonder just what it is, and what you can do with it. It’s an expansive plugin that currently has 36 modules with different functions. Jetpack makes running your blog a lot easier. You can use jetpack to handle a lot of functionality on your site like contact forms, analytics, cloud, comments and more. This guide will explain how you to use Jetpack and we what each modules does. This week we are going to review Team Builder, our very own plugin that is designed to build a showcase for your team on your WordPress site. There are plenty of team showcase plugins and add-ons but I’m sure you won’t find anything better than Team Builder. In industries where the people behind your work are just as important as your work – having a team showcase is a good idea for any company or organization. It’s a nice way to show your team members how proud you are of them as well as show your visitors just how awesome your team is. People are naturally curious and adding a team showcase can satisfy that curiosity as well as gain their trust. This is especially important if you are in the design or tech industry. Nowadays there are all sorts of phishing scams lurking on the internet, many people can’t or won’t do business with a company they don’t trust. September was an interesting month for the internet. Champions of fair use got a huge win against patent trolls in the US Federal court via the rejection of Universal Music Publishing Group’s attempt to abuse copyright law in the case of UMPG vs Lenz. We saw another security and maintenance release in the form of WordPress 4.3.1. There were also many intriguing heartfelt stories published in relation to the European refugee crises posted on everybody’s favorite blogging platform (WordPress of course). Contact forms make it easy for people to get in touch with you. Ninja Kick: WordPress Contact Form plugin can make it easier for users to get in touch with you and has some interesting features as well. There are many advantages to be had by adding a responsive contact form to your website. You can grow your audience, gain a stronger connection with your visitors, generate more traffic and bring in more revenue. An appealing and inviting contact form is an ideal way for people to ask questions, reach out for advice, or make inquiries. Regular contact forms are well suited for getting in touch with your visitors, they don’t offer anything special in the way of looks or functionality. Ninja Contact Form plugin was designed to increase the likelihood of making contact with your visitors. If your goal is to make yourself readily available, promote a service or product, then this plugin may be your answer. WordPress is an awesome solution for creating revenue online. If you don’t know WooCommerce is a free eCommerce plugin for WordPress that allows you to sell anything. Almost anybody can set up an online store from scratch in less than an hour using a WordPress theme along with WooCommerce. Right out of the box you can do a lot with WooCommerce. You have the option to manage payments, shipping and create scalable solutions. Developers have really taken a shine to this open source eCommerce platform. There is a sea of plugins that integrate with WooCommerce to give you even more control at an affordable price. Competition is stiff, which means that the consumers reap the benefits. With add-ons and plugins you can make WooCommerce even more powerful. Take more control over the style options and customize your WooCommerce solution by utilizing plugins. WordPress is one of the most comprehensive content management systems today. In 2014, there were over 74 million websites running on WordPress. At its core, WordPress CMS is stable and secure but the fact that WordPress is so popular makes it a target for hackers. Having a good security strategy can prevents attacks from even the worst script kiddies, spammers, trolls, trackers and hackers of all kind. Securing your website is a critical part of developing it. You also need strong security to gain trust and confidence from your visitors as well as boost your website search ranking. I’ve found the best way to keep on top of things is to do a security audit once a month so make sure your site is airtight. I mean, what are Sundays for right? During the audit you will need to ensure that your user accounts have stong passwords and follow some general safety rules. The version of WordPress you installed is usually displayed in your header. You can opt to hide this information from hackers that can use this information to exploit your site. Let’s face it, sometimes it can be a mess trying to centralize all your social feeds in one place. I have enough problems keeping track of my growing list of email and user accounts. That’s why I’m always glad to find apps that help me organize my workflow. Flow-Flow: Social Streams does just that. It lets you collect and display social media content from your favorite social network. This premium WordPress plugin makes it easy to build an incredibly powerful social hub. Flow-Flow has the capability to handle multiple feeds and multiple users in a single network. Mix and match any combination of social feeds you’d like. The possibilities are unlimited. For instance, you could have 5 different twitter feeds and 4 Google+ feeds in a single stream. Flow-Flow displays social feeds in a beautiful responsive grid, that is easy to customize and simple to install. Filter add and remove streams easily inside the editor. There are many web services that charge recurring fees for similar functionality. Create an awesome social media hub on your site without the monthly fees. Link any RSS to your website and expand your audience. Flow-Flow is a money saver and a money maker. Getting the high-quality content free of cost is not less than any gift. The websites developers while writing content keep in view the needs of their users in order to satisfy them. But they are also human beings like us and they need to get satisfied too, and their satisfaction lies in donations that are given by the people who can afford it. Sliding menus are quickly becoming one of the most popular trends in WordPress web development. They look stunning on desktops as well as mobile devices. These menus are located in one corner of your site. When the menu pops up, the content is moved aside. Superfly is an awesome WordPress plugin for building fly-out menus on your website. It’s one of CodeCanyon’s top selling plugins, and easily lets you generate a trendy new navigation menu on your site. I was really impressed by the sleek design options and smooth performance. Long gone are the days where you need to suffer through a clunky nav menu to plod through a website. Take a look at the back-end and you’ll see clean code, and some of the best industry standards for animation and smooth performance.